Turkish President Recep Tayyip Erdogan has announced a possible military operation in Syria's Afrin, aiming to eliminate a "terrorist corridor" on Turkey's southern border. The Turkish army opened artillery fire on the Kurdish militia positions in the Syrian city of Afrin, the Hurriyet newspaper reported. According to the newspaper, the Turkish Armed Forces fired 10 shots from the territory of the Reyhanli district in the country's province of Hatay. Following the military operation, Turkish President Recep Tayyip Erdogan announced a possible military operation in Syria's Afrin on January 13, adding that Turkey will clear its border of "terrorists." "If the terrorists in Afrin don't surrender we will tear them down," Erdogan told the country's ruling AK Party in the eastern Turkish city of Elazig, speaking about the Peoples' Protection Units (YPG) militants, which are considered to be a terrorist group by Ankara. As the president clarified, the Kurdish YPG were trying to create a "terrorist corridor" on Turkey's southern border, connecting Afrin to Kurdish-controlled areas to the east. "With the Euphrates Shield operation we cut the terror corridor right in the middle. We hit them one night suddenly. With the İdlib operation, we are collapsing the western wing," Erdogan said. The president went on by saying that Turkey was dissatisfied with the US for failing to stick to their promises, commenting on Washington's decision to stop supplying the Kurdish forces with arms, announced in December 2017. However, up to now, the US has failed to prove their stance with documented evidence and the statements from the White House continue to differ on the issue. "The US sent 4,900 trucks of weapons in Syria. We know this. This is not what allies do," Erdogan said. "We know they sent 2,000 planes full of weapons." The statement was made amid Ankara's recent summoning of the US Charge d'Affairs twice within 24 hours over the issues of Washington's support for Syrian Kurds and the US listing Turkey among countries, not safe for travel. As Erdogan stated, Turkey's possible military advance in Syria's Idlib province would eliminate Kurdish militia in the area, which neighbors Afrin. 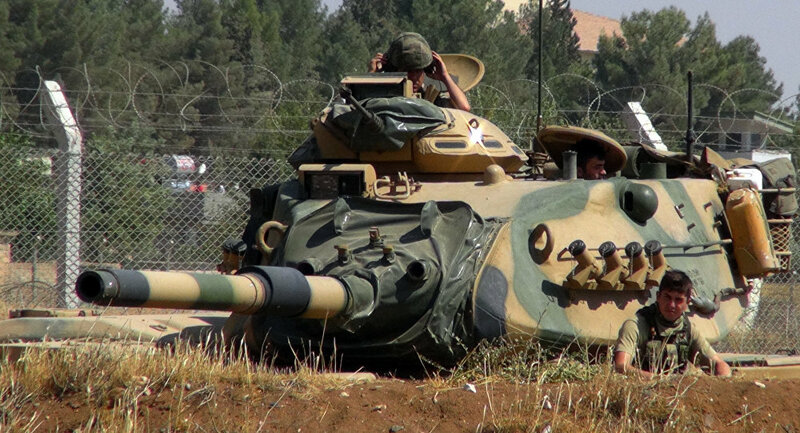 The Turkish army entered Idlib three months ago as a guarantor of the peace settlement process and has repeatedly accused the Syrian government of violating the de-escalation zone borders.